Record 14 PMSS Folk Songs and Dances 1913-1928 is a record by Evelyn K. Wells of activities related to folk songs and dances at Pine Mountain Settlement School from 1913 until 1928. Pine Mountain’s understanding and appreciation of the background of its children, saving for them all that was fitting of their inheritance, is evident in many ways. — In its choice of mountain materials in its building and furnishing its insistence on simple appropriate clothing its Fireside Industries its preservation of native songs and dances. In the early days the laying of the floor of a new building was the occasion for a set-running party [Kentucky Running Set] when children, workmen, teachers all danced; and everyone who knew a son-ballet was urged to teach it to the rest. It was the more or less unwritten law that new workers and children should learn Little Mohee and Sourwood Mountain and the Lonesome Low from somebody already here, just as soon as they could, and be taken through the Running Set. People who were very methodical wrote down their ballads or had the typed. Then came the days when the children sang ballads after supper twice a week, and we had such a store of them that the office manuscript copy was often in demand. Then the school became so large, the work of running it so burdensome that this pleasant custom had to stop if dishes were to be washed before study hour and about this time, too, we had to plan set-running parties so privately that nobody in the neighborhood would hear of the till the last minute lest the more lawless element come and break things up. Now, in 1928 we look back longingly on the days when all our neighbors sang, and all the neighborhood came to our parties. 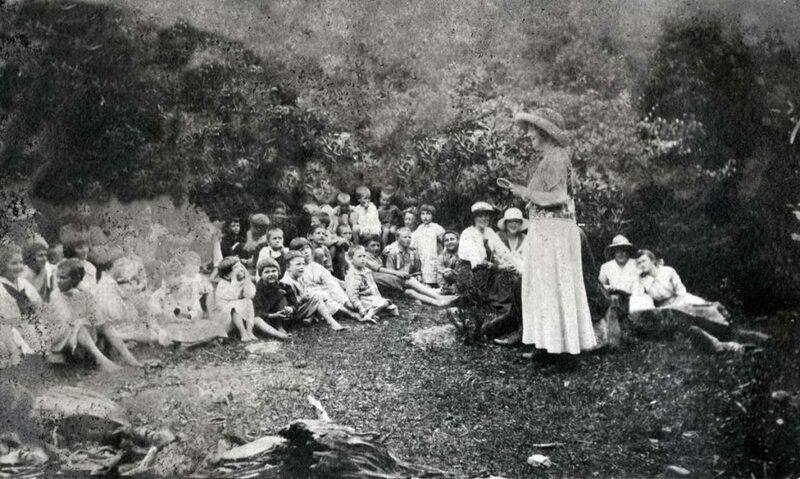 In the summer of 1916 Miss Loraine Wyman, a pupil of Yvette Guilbert, and Mr. Howard Brockway, a musician, came to collect songs in the mountains. Miss Wyman wanted to increase her store of folk-songs of english origin, and said when she came that she would be satisfied if she found three songs of true worth, she and Mr. Brockway went home after their three weeks here, with at least seventy-five. These have since been set by Mr. Brockway and published, the first volume, Lonesome Tunes, by the H.W. Gray Co., New York, the second, Twenty Kentucky Mountain Folksongs, by Ditson. Miss Wyman and Mr. Brockway made their headquarters at the School. their second volume is dedicated to Uncle William Creech. In August 1917 Cecil Sharp, the noted English Collector, and his secretary, Miss Maud Karpeles, spent a brief five days at the School. Mr. Sharp’s book of folk tunes, in which Mrs. Olive D. Campbell collaborated, was already in press and he read proof for it here, so his work on folk songs was really done by the time he came here although he heard and noted whatever songs he could, finding some particularly fine ones with Singing Willie Nolan of Incline. the story of his discovery of the Running Set [Kentucky Running Set] is told in the Introduction to Part V, The Country Dance Book, (Novello, London), and we need only mention here Pine Mountain’s pride and pleasure in having introduced him to a dance which has since become famous throughout this country and England. Mr. Sharp recognized in the atmosphere of Pine Mountain favorable air for the flourishing of mountain songs and dances and made us feel definitely that what had always been our pleasure was also our duty, the keeping alive of these ancient things that were the children’s heritage. We have therefore always made a point of singing the mountain songs and running sets, and have added to the children’s store only those that were equally good from a folk-art point of view. 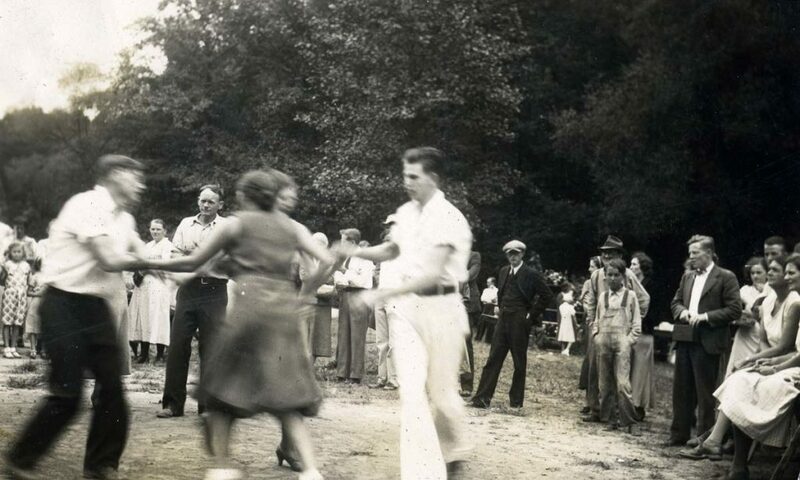 The “Music Committee” of the school has barred not only jazz but also all cheap and sentimental music, and modern social dancing has so far had no place with us. Important, however, as we always recognized the historical element to be, we should never have limited ourselves to the folk songs and dances had we not found that they were ideally suited to the children’s ne, from an aesthetic, recreational and social aspect. they have been so tremendously popular that there has been no need for anything else. In 1921 it became necessary to have printed ballad books, for the children coming to us were no longer singing songs they had learned by oral tradition, so the words of the songs we used most were collected and printed in the small grey books that were used from then on. In 1926 Miss Wells worked on a new collection, which was to have not only the words of the ballads but a line of tune; but unfortunately it was discovered that there were copyright difficulties about such a collection and the matter has had to rest there The little grey books, therefore, printed in 1921, which at first we were able to sell to the children and to other schools are now very precious and all we have for the use of the school. Even now, in 1928, with the change of the countryside these last few years we are beyond the folk-song stage, and whatever singing of them is done now, is self-conscious and a little forces. For the last four or five years we have had definitely to recall for the children, the reasons why Pine Mountain believed in teaching them these songs and dances, for we have been sure that if they were sufficiently grounded in their own songs they would have a touchstone and a standard of taste for the rest of their lives which must be lived in a new cultural setting Whatever the future policy of Pine Mountain in regard to music and dancing for the children it must realize its obligation to the high standards of our early years. A traditionally correct May Day began the year after Mr. Sharp‘s visit, and for two years we had a sort of revival of the Guild Procession the children carrying garlanded implements, to glorify their work. The poultry department had a basket of White Leghorns, there was a young calf with a wreath around its neck (rebelling against its role), there were baskets and sweepers and farmers in the procession which was headed by the May Pole bearers and a wound-up by a troupe of play-actors. 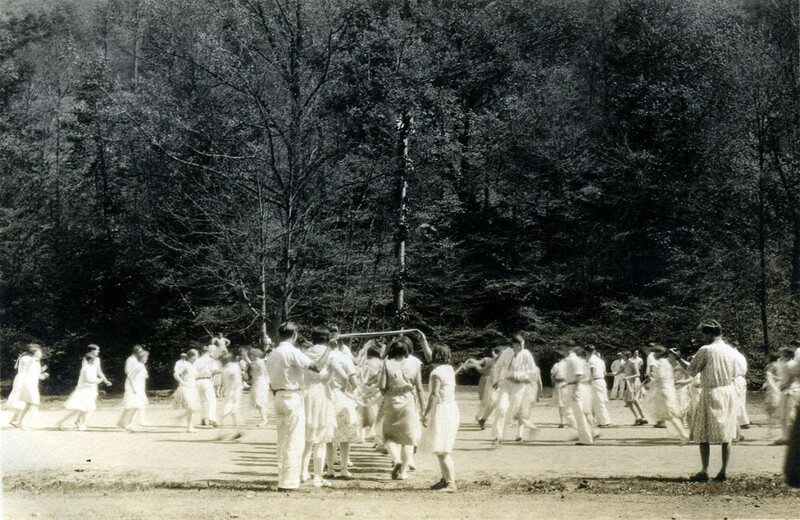 Pine Mountain welcomed the ancient May Day idea that in the spring one danced and worshipped nature and felt the renewal of all our functions. Since 1923 Miss Dorothy Bolles of Boston a pupil and friend of Cecil Sharp, has spent the month of April at Pine Mountain, and every year but one Miss Mary Cunningham has come with her. Miss Bolles has danced with the children daily during the month, sometimes with as many as five groups a day, taking them during recess, in their spare time, after supper, and her inspiring direction and Miss Cunningham’s music have together produced a May Day festival in which practically everyone in the school has danced, and which has grown steadily in repute through the country. Our audience is larger every year, and May Day gathers in our old students as much as any day of the year. The general set-running [Kentucky Running Set] with which the program of Sword, Morris and country Dances ends, is open to all and tremendously popular. Since 1926 May Day has begun with a group of Morris Dancers, going early in the morning from house to house and dancing to the accompaniment of a concertina and fiddle. Miss Bolles has gathered up all the informal interest in dancing which has gone on through the winter ad only the sick-abed or the conscientious objectors (and even they sometimes have had a change of heart) have stayed out of the daces though of late years the boys have become a little self-conscious about the country dances. No boy would stay out of a Sword Team, however, and the feeling of team play that they have gotten from the Sword Dances hass been a very wholesome thing for our young individualists. In 1926 Miss Wells took twelve High School boys and girls to the State Convention of Women’s Clubs in Middlesboro where they gave an entertainment of dances and songs they showed to a very representative Kentucky audience something of Pine Mountain’s type of young people and their recreations and for the boys and girls it was a great occasion, In 1927 Miss Wells spent a week at the Wooten Community Center, teaching dances and songs to a group of young people gathered there for a Folk School. Wooten was once a strong-hold for native ballads and dances but they had completely died out in their native atmosphere and were welcomed back. In 1928 there was an invitation to come to the Stuart Robinson School at Blackey, which had to be refused. The boys and girls who have gone out from Pine Mountain have often introduced the songs and dances where they have gone. Clara Callahan, on scholarship at a Girl Scout Camp on the Ohio river had a group of folk-dancers; Dillard Turner, teaching a country school at the Head of Cutshin had a victrola and records, and his children spent their recess dancing; Fair Annie Harris, teaching in a mining camp, aroused great interest in the dancing she taught in her school. Wells, Evelyn K. The Ballad Tree: A Study of British and American Ballads, Their Folklore, Verse and Music, Together with Sixty Traditional Ballads and Their Tunes. New York: Ronald Press, 1950. Print. EVELYN K. WELLS “A Little True Blue American,” Over Sea and Land: Our Southern Mountains, November 1920, p. 140.